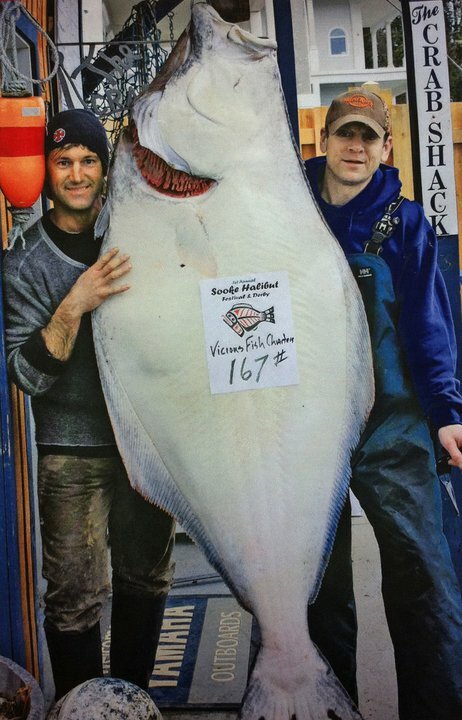 The 1st annual Sooke Halibut Derby & Festival was last weekend. 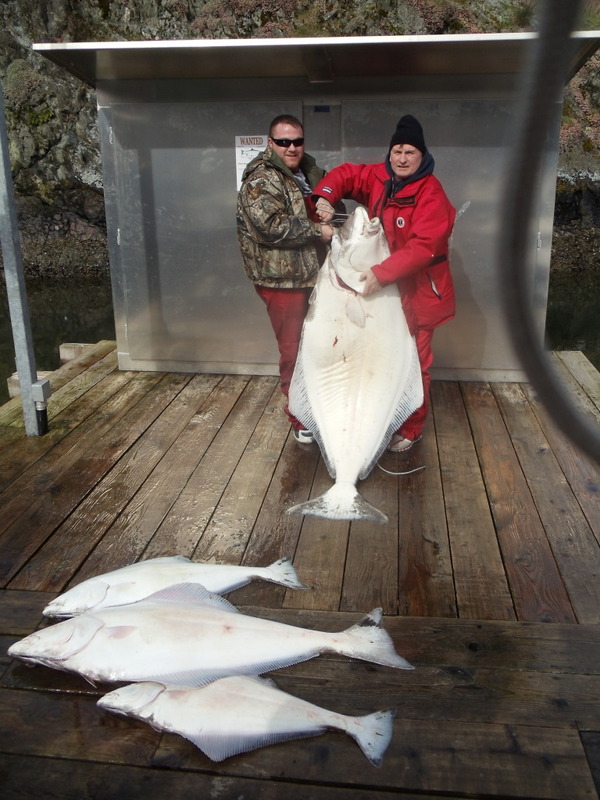 Some pretty ugly weather on the ocean, but the contestants slugged it out like champs, with well over 30 halibut caught. Des from Vicious Fish Charters had a seriously good Saturday, with a 167 pounder 1st place, as well as taking 3rd and 4th place. Des wouldn't give up where he caught them, though, other than "somewhere out west". The derby also donated 150 pounds of filets to the Sooke Food Bank, and proceeds to the Charters Creek Salmon Centre and other local good cause. Great event, hopefully the first of many more in years to come. 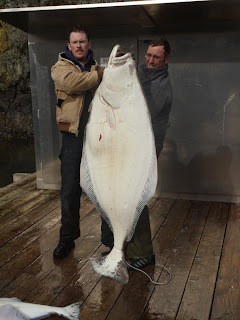 "Well we had a few days of halibut fishing booked over the last few days started off on Friday with a no go because of weather, then Saturday I had a crew that toughed out some horrible weather for a few hours and we landed 4 halibut between 25-40lbs. Most were caught on herring or octopus, we fished off Albert Hd. Sunday was another weather day just too big of waves for my crew's liking. Monday we managed to get out again off Albert Head. We got the anchor down around 8am and held on as the wind, rain,and waves pounded us. It was around 11am, not a bite, and I was beginning to think 'here comes my first no-fish day of the year', when all of a sudden the wind died,the tide changed and the fish started biting. Our first fish was actually a double header, we landed a 30lbr first and then waited and waited some more for the next one to come up. 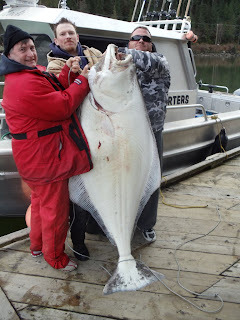 When it finally did it was much bigger than i thought it was going to be, a quick harpoon job and she was in the boat. I guessed it at 150lbs, we quickly caught 2 more a 60 and a 30 and our tags were full. Back at the dock when I put her on the scale at pedder bay she was exactly 150lbs. 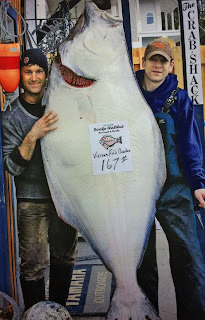 We got the halibut octopus, mackeral and herring in 300ft of water." Just goes to show you "Stick and Stay and Make it Pay" holds true yet again...good job Trevor. That's a good day's fishing right there. No salmon reports this week ... seems to be halibut on everyone's minds! Get out there and chase one of your own, just play safe.